Kathleen Clara Glaser (Kaye) passed away peacefully on June 7, 2017 in Tucson, Arizona. 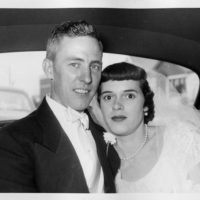 Kaye, 90, was born on January 16, 1927 in Dubuque, Iowa. Kaye and her husband Jack moved to Tucson in 1959 where she raised her six children. After Jack passed away in 1976, she worked for many years in the children’s department at Levy’s Department Store at El Con Mall. Kaye is preceded in death by her husband John “Jack” and parents Muriel and Edward Vosberg, brothers Donald “Huck” (Eleanor) Vosberg, Edward (Ollie) Vosberg, and sister Mary Jane “Janie” (Ben) Glaser, and children Jeffrey Sr. and Jay. Kaye is survived by her children John (Mary), Jim, Jeanie (Dean) Schwemmer, and Jerry (Sandy), her 17 grandchildren Dominic, Jeffrey Jr., Amber, John Matthew, Christopher, Jay, Michel Schwemmer, Sean, Anthony, Kevin, Rebecca, Daniel, Katie, Kelly, Laura, Brian, and Michael, and six great grandchildren James, Jeffrey III, Ty Peters, Kaitlyn, Dmitri, and Garrison. Visitation will be held on Saturday June 10, 2017 at 9:00 a.m. followed by a funeral mass at 10:00 at St. Joseph Catholic Church, 215 S. Craycroft Road. Graveside services will follow at Holy Hope Cemetery, 3555 N Oracle Road in Tucson.